A high-resolution fluorescence microscope with large area sample coverage is available. 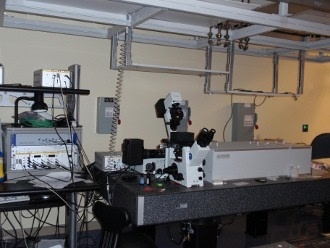 This system consists of an iMic live cell fluorescence microscope (TILL Photonics, Munich, Germany), which is fully computer controlled by a JAVA-based application software to perform complex acquisition protocols. The microscope provides for dynamic, narrow-band fluorescence excitation through a monochromatic-coupled Xenon-arc lamp light source (Polychrome V, TILL Photonics, Munich, Germany). It can rapidly obtain fluorescence images through the automated exchange of up to 3 different filter sets. The microscope platform supports large area high-resolution image acquisition of samples up to 2.5” x 2.5” by translating the sample stage in steps of the field of view of a 100x microscope objective. Point spectroscopy, fluorescence recovery after photobleaching (FRAP), wide-field and total internal reflection laser excitation are also available through galvanometer-positioning of a 150 mW, 532 nm continuous wave laser. A back-illuminated electron-multiplying CCD camera (Cascade, Roper Scientific, Trenton, NJ), coupled to a SpectraPro imaging spectrograph provides for single molecule fluorescence imaging, fluorescence, and Raman spectroscopy. 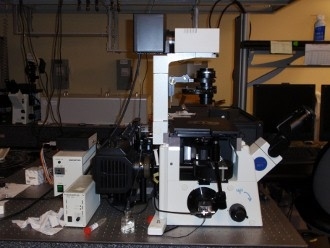 This unique, custom-built microscope system can obtain high-sensitivity micro-Raman spectra from sample volumes as small as 1 femtoliter. Simultaneously, it can use the same laser beam to optically trap (through laser tweezers) individual cells, cellular organelles, and even individual nanoparticles, such as liposomes or lipoproteins. The system is built around an inverted optical microscope, which was converted to enable laser-tweezers Raman spectroscopy. The main microscope frame consists of an Olympus IX-71 microscope, with a 60x, NA 1.2, water immersion objective optimized for near-IR operation. The laser source is an 80 mW, 785 nm diode-pumed solid-state laser (Crystalaser, Reno, NV). 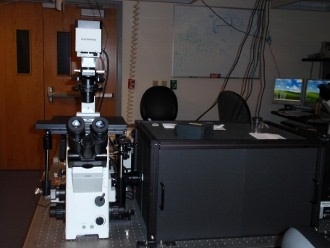 The microscope is equipped with a mercury arc lamp for white-light fluorescence excitation through appropriate filters, and differential interference contrast for visualizing cells. Optical trapping and fluorescence excitation can be performed simultaneously. Spectroscopy is performed through an attached SP2300i spectrograph (Roper Scientific, Trenton, NJ) and a back-illuminated thermoelectrically-cooled deep-depletion CCD camera with 1340x100 pixels (Roper Scientific, Trenton, NJ). This microscope, which is a custom-adaptation of a commercial real-time confocal fluorescence microscope (Andor Revolution), can rapidly take three-dimensional confocal image stacks of cells or tissue sections at frame rates as high as 360 frames per second. It is also outfitted with an optical laser trap to manipulate cells in suspension. The real-time confocal fluorescence microscope consists of an Olympus IX71 microscope from with a CSU10 spinning disk unit spinning at 1800 rpm (Yokogawa, Japan), to which a motorized filter wheel (Ludl Electronics), and an iXon electron-multiplying back-illuminated CCD camera (Andor Technology, Inc, Ireland) are attached. The maximum full-frame read-out rate of the 512x512 pixel detector is 17 frames per second, while smaller regions of interest can be read out with up to 360 frames per second. The sample is supported in a z-piezo scan stage (MadCityLabs, Madison, WI) which provides for rapid translation in the vertical direction, allowing for the acquisition of 30 vertical confocal slices per second. The AndorIQ control software controls the spinning disk, filter wheel, CCD camera, and piezo scanner for synchronized data acquisition and can be used to program complex acquisition protocols. 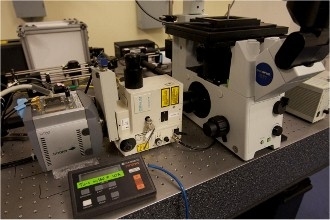 The optical laser tweezers uses a 2W 1064 nm CW laser, which is coupled into the main microscope frame by a dichroic mirror. CBST houses a 4-channel scanning confocal fluorescence lifetime microscope with single molecule sensitivity (MicroTime 200, Picoquant GmbH, Berlin, Germany) - the only such instrument currently available on the West Coast. 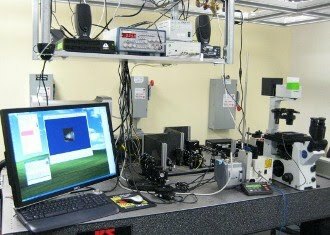 This microscope has three short-pulsed laser excitation sources operating at 405 nm, 1mW, 70 ps, 40 MHz; 470 nm, 4 mW, 70 ps, 40 MHz; and 640 nm, 5 mW, 70 ps, 80 MHz. The repetition rates of all lasers can be adjusted arbitrarily. 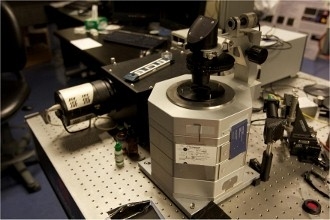 The system uses an Olympus IX71 as the main optical microscope. It can scan the microscope objective relative to the sample with sub-nanometer precision and 100 µm x 100 µm x 100 µm range of translation. It has four single photon-counting avalanche photodiodes as detection elements and can collect photon arrival times from all 4 channels simultaneously in a consecutive data file. Each photon event is logged as a 32 bit event that records the macroscopic photon arrival time with 100 ns precision and the microscopic relative time between laser pulse and photon event with 35 ps precision. An additional PicoHarp 300 system can also record photon events continuously with 4 ps absolute precision. An Acton SpectraPro 300i imaging spectrograph equipped with a Princeton Instruments back-illuminated 1340x100 pixel PIXIS CCD camera serves as spectroscopy equipment. The software supplied with the Microtime can display 1D, 2D, and 3D fluorescence images, it can perform point spectroscopy, fluorescence resonant energy transfer (FRET), fluorescence lifetime imaging microscopy (FLIM) and spectroscopy, and photon correlations, such as fluorescence correlation spectroscopy (FCS), photon antibunching, alternating laser excitation, and photon cross-correlation.